My friend MaryAnn and I go out lunch every month. Every month we go to the same place, the name of which place I’m not going to mention because 1) I’m a little ashamed to claim I eat there and 2) I don’t want to slander the place with what I have to say, particularly that I’m ashamed to eat there. So, the restaurant shall remain nameless. The reason we eat there every month is because 1) we’ve become regulars and it’s the only public place we can go and be “recognized” like famous people, and 2) they don’t kick us out for staying too long or being too rowdy. The staff at this particular restaurant has remained the same for as long (and probably longer) as MaryAnn and I have been going there for lunch. That means we’ve become fast friends with the waitress. OK, maybe not “fast” friends, but we all know each other on a first name basis and the waitress likes to walk slowly by our table from time to time to catch up on what’s going on in our lives. She also makes sure our drinks are refilled often, probably to give her an excuse to hear what we’re saying. This past Christmas, without consulting me, MaryAnn decided to get a gift for our waitress. Yes, that’s right, she gave the waitress a beautiful, sparkly snowflake pin that, for all I know, was made of solid gold and dozens of diamonds. All I did was feel sheepish and compliment MaryAnn on how nice she is. They’re called reFILLS. 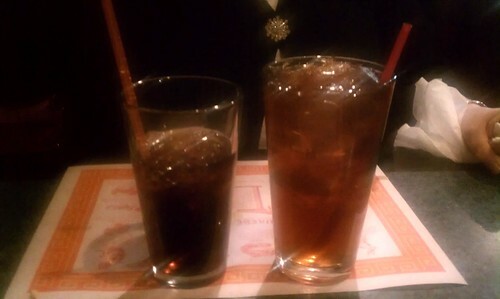 My Coke is on the left, MaryAnn’s ice tea is on the right. Not only is her glass bigger, but it’s filled to the top. Mine? The drink for a person who didn’t give the waitress the gift of jewels? A measly half glass of pop. Next Christmas I’m giving the waitress a car. LOL! LOL! If you’re going to be giving cars as gifts then I’ll personally refill your plate at the buffet! Did i laugh?? yes I did you are such a card Sara, maybe a nice Ferrari will get your glass filled lol. Or at least the key ring.